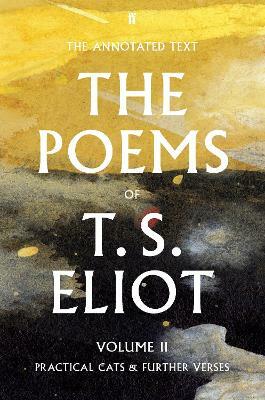 The Poems of T. S. Eliot is the authoritative edition of one of our greatest poets, scrupulously edited by Christopher Ricks and Jim McCue. It provides, for the first time, a fully scrutinized text of Eliot's poems, carefully restoring accidental omissions and removing textual errors that have crept in over the full century in which Eliot has been so frequently printed and reprinted. The edition also presents many poems from Eliot's youth which were published only decades later, as well as others that saw only private circulation in his lifetime, of which dozens are collected for the first time. To accompany Eliot's poems, Christopher Ricks and Jim McCue have provided a commentary that illuminates the creative activity that came to constitute each poem, calling upon drafts, correspondence and other original materials to provide a vivid account of the poet's working processes, his reading, his influences and his revisions. The first volume respects Eliot's decisions by opening with his Collected Poems 1909-1962 in the form in which he issued it, shortly before his death fifty years ago. There follow in this first volume the uncollected poems from his youth that he had chosen to publish, along with such other poems as could be considered suitable for publication. The second volume opens with the two books of poems of other kinds that he issued, Old Possum's Book of Practical Catsand his translation of Perse's Anabase, moving then to verses privately circulated as informal or improper or clubmanlike. Each of these sections is accompanied by its respective commentary, and then, pertaining to the entire edition, there is a comprehensive textual history recording variants both manuscript and published. Christopher Ricks's publications on Eliot include T. S. Eliot and Prejudice (1988), Inventions of the March Hare: Poems 1909-1917 (1996), and Decisions and Revisions in T. S. Eliot (the Panizzi Lectures, 2002), together with True Friendship: Geoffrey Hill, Anthony Hecht and Robert Lowell Under the Sign of Eliot and Pound (2007). Jim McCue is the author of Edmund Burke and Our Present Discontents (1997) and editor of the Penguin Selected Poems of Arthur Hugh Clough (1991). For fifteen years he worked for The Times, where he wrote the Bibliomane column. His imprint, the Foundling Press, began with the first separate publication of T. S. Eliot's Eeldrop and Appleplex, and has printed for the first time writings by Alexander Pope, Ben Jonson, Henry James and A. E. Housman.